My brother Eric is a master craftsman. 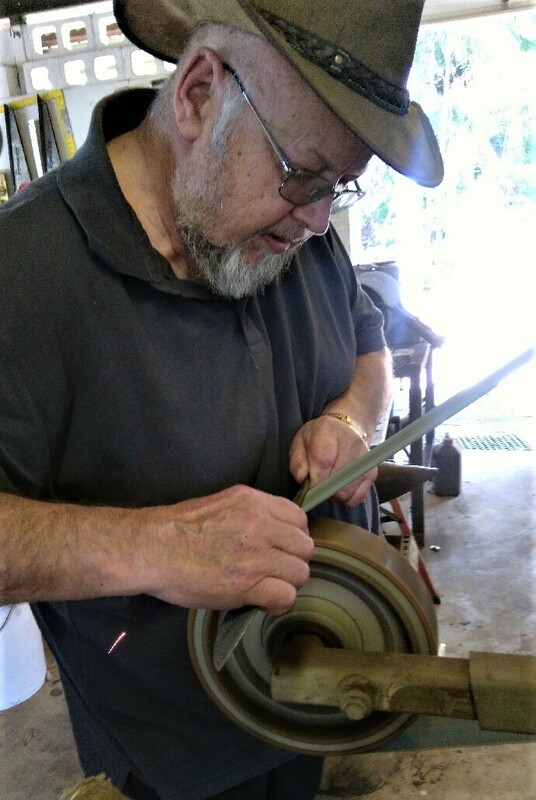 Many years of experience has honed his skills in crafting beautiful knives. We have been gifted several over the years. 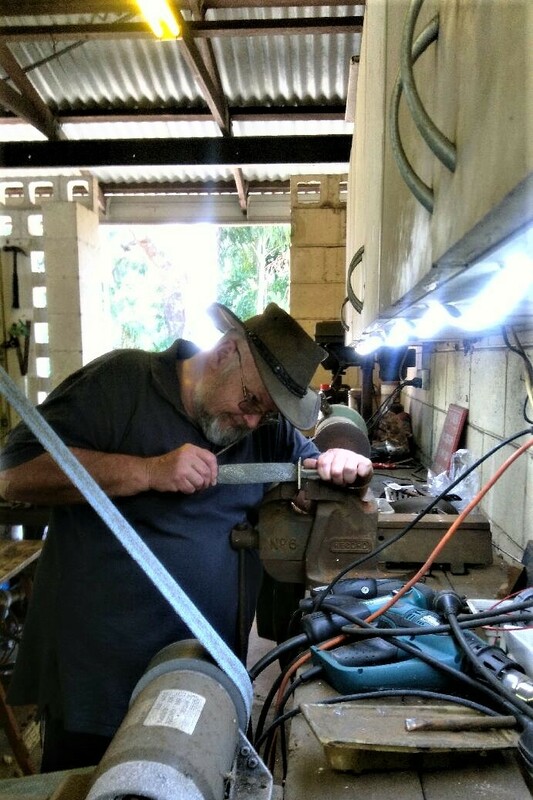 When we left to go to Darwin on a roadtrip, I decided to ask if he would help me make my own knife. Little did I know what I was asking. He looked at me. Smiled. Thought about it for a while. Then he said that in order to do that I would have to be initiated into the sacred secrets of the Man Cave of Knives. I agreed to channel my testosterone and was duly initiated for entry to the inner sanctum. And so My Knife Project was born. Here Eric is showing me his stock of assorted blocks of wood. I was to select a handle for my knife. I must add here that he also has a wonderful array of stones. I was sorely tempted. 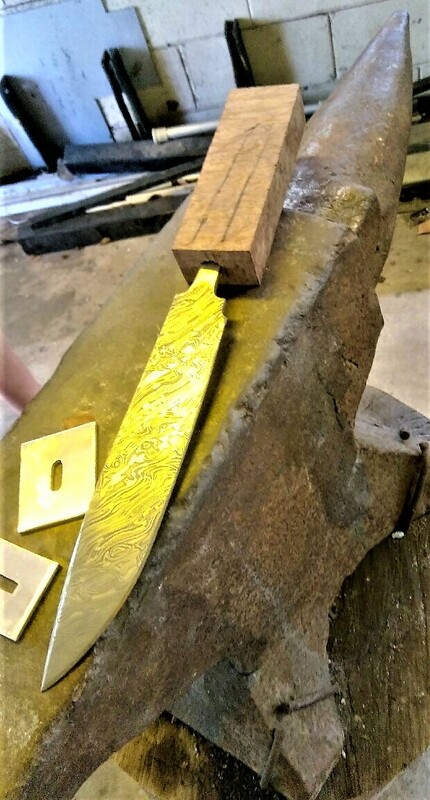 But I was told that in order for me to make a stone handle would require I have the equivalent in knife skills of having gone through learning to sit up, crawl, walk, run – and reach marathon standard. I was not even at the sitting up stage yet. So from that I gathered that a wooden handle was perhaps the best option. He agreed. I had already chosen a blade. This too was a skill beyond my novice skills (=lack of any skills) and time availability. 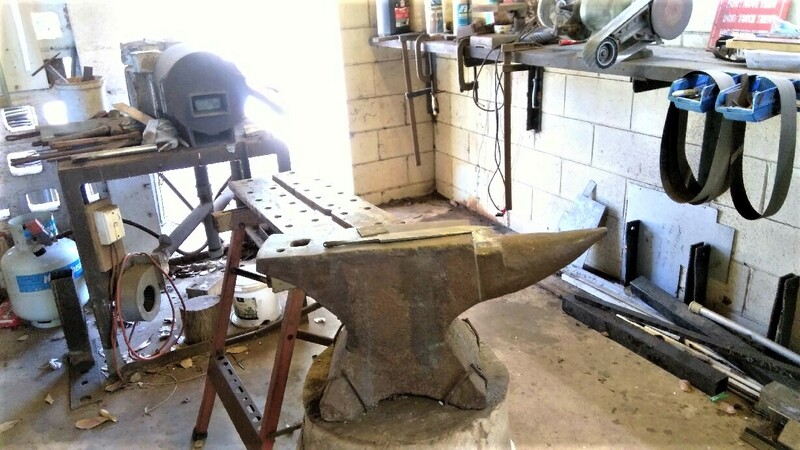 That, and the lack of an appropriate closed environment oxygen free forge and heavy duty sledgehammers, dictated the use of a ready made blade. In order to make good quality stainless steel and Damascus steel blades both require such a forge. Although Eric has a forge, it is not a closed environment one. He buys his steel ready made. Stainless steel from Melbourne. Damascus steel from a local blacksmith. The quality of both is impeccable. I was happy. And opted tor a 20cm Damascus steel blade. For the handle I selected a piece of York Gum burl. He said it makes a nice looking handle and is good to work with. My handle would be 12cm long by the time it was finished. 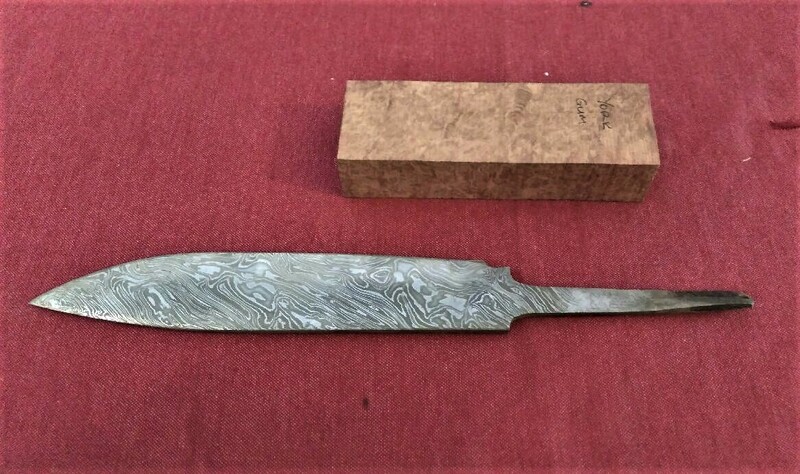 This “Modern Damascus” is made from several types of steel and iron slices welded together to form a billet, and currently the term “damascus” (although technically incorrect) is widely accepted to describe modern pattern welded steel blades. The patterns vary depending on how the smith works the billet. The billet is drawn out and folded until the desired number of layers are formed. 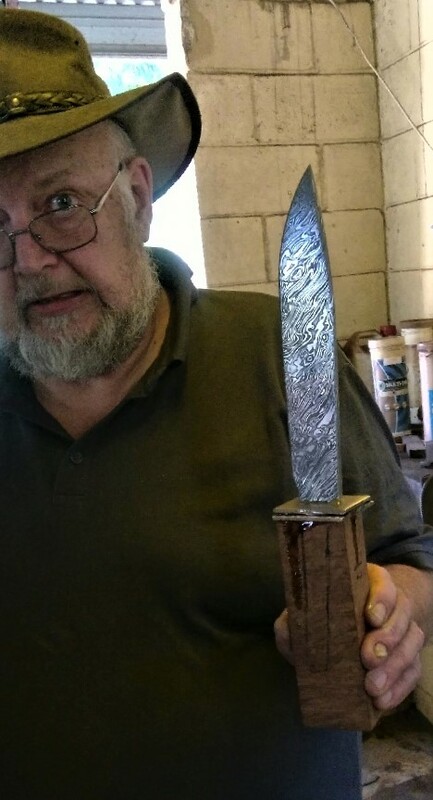 Eric told me his Damascus steel blade has been folded seven times, creating a ‘puff pastry’ (my term) steel equivalent of 128 layers. This is then etched in acid which brings out the unique pattern of the folds. Eric has an impressive array of deadly looking tools. Belt sanders of assorted kinds, band saws, drills and other tools the names of which are foreign to me. As is their use and handling. 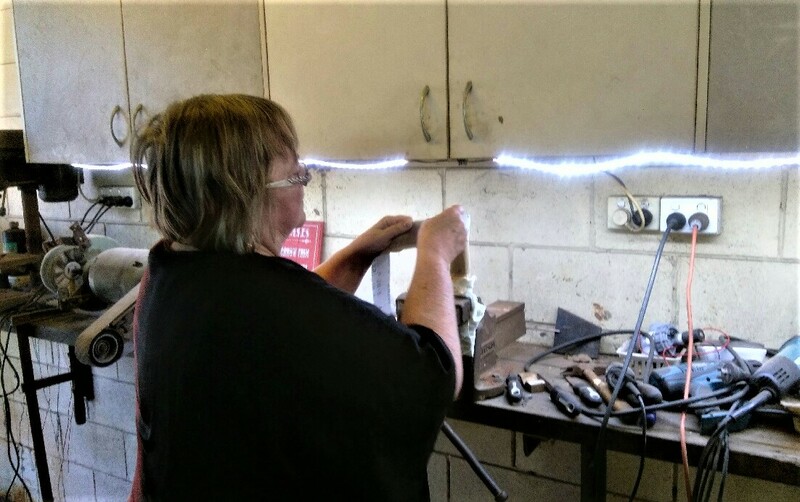 I had visions of my fingers, hands and arms being severed and flung around the workshop before I knew what had even happened. And fortunately for me, I was told that they – being Eric and TRH (The Retired Husband) would be doing the more challenging bits of the work. I was happy to stand and watch, ask lots of questions (after all, an apprentice’s job is to have an enquiring and learning mind), take notes and photographs. All of which I did with enthusiasm. The above picture has the knife tang inserted into hole drilled into the handle being tested for fit. The two bronze bits next to the blade are the bolsters. I wanted a double bolster with a strip of black rubber in the middle. It looks classy. The holes in the bolsters were cut by TRH under Eric’s tutelage. He’s a fast learner, being a master craftsman himself. Many of the skills are transferable, needing just a bit of direction and tweaking in adjusting to working with metal. The rest of the day involved ensuring a perfect fit for the tang and the bolster. The bolster was glued together and the hole in the handle filled with glue. The tang having been inserted, the assembled knife was secured into an upright position for the glue to dry overnight. 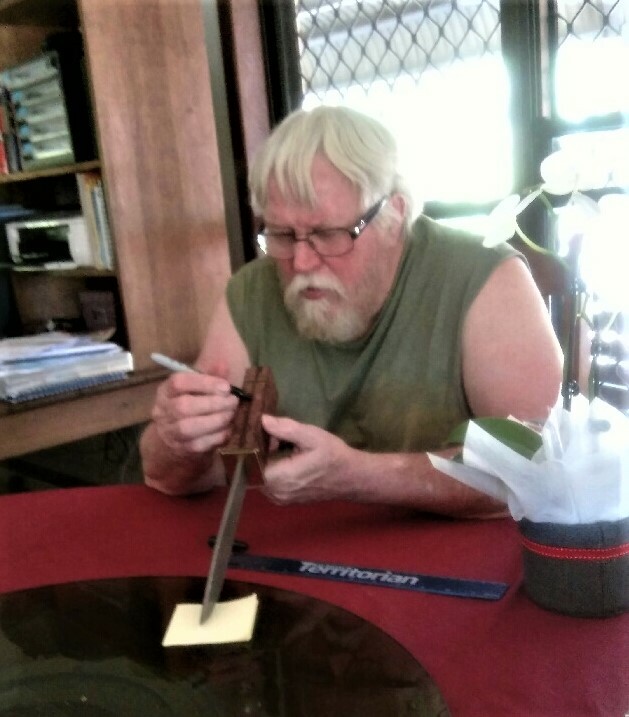 On day 2 we trekked into Darwin CBD to have the blade engraved with the maker’s mark. I was in the midst of an ethical dilemma. Having discussed this with TRH on the way to pick Eric up, I was still no closer to a solution. You see, I was feeling all kinds of uncomfortable putting my moniker on a knife which I had very little hands on involvement in making. However, I was assured that as it was MY knife, it must have my name. So that is what happened. It is engraved Raili Iiris. When we get home I will add my brother’s name to the other side of the blade. That feels right. Engraved knife in hand, the next job was to design the handle. My hand is smaller than a testosterone filled one. That created a few moments of re-thinking. Having settled on the design, Eric drew the outline on the handle and instructed TRH in the cutting of the bolster and the shaping of the handle. There was lots of technical discussion about pressure points and such. Lots of brass dust followed buckets of sawdust flying from a monster muncher of a sanding machine. I had visions of shredded hands had I been handling it. Never in my life have I used an electric power tool. So this job too was beyond the skills of a non-sitting novice. And guess what? 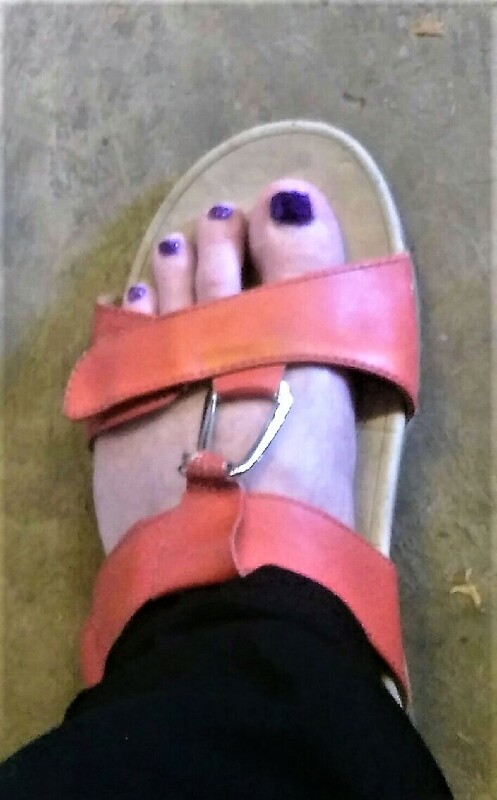 I got to do some hand sanding! It was a proud moment. Boy was there a LOT of sanding. 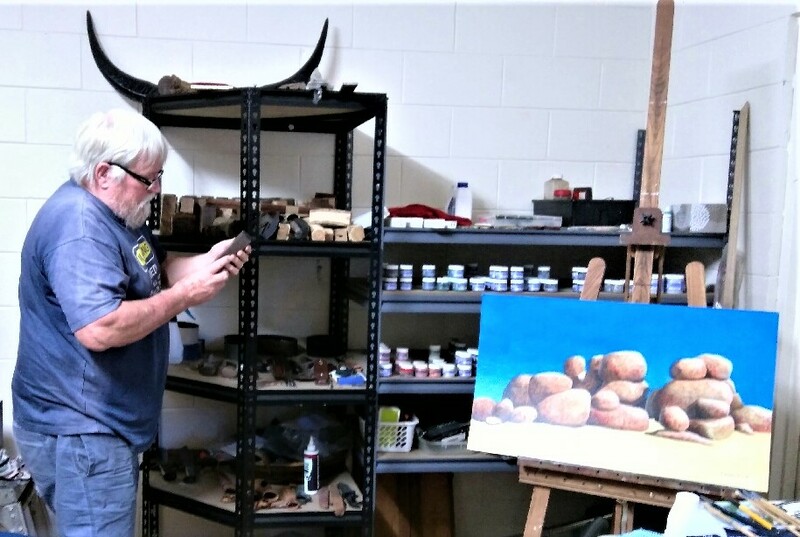 And then there was the intricacies of sealing and glueing the natural fractures in the burl which only become evident on sanding and more sanding. When it was deemed the sanding was sufficient, the handle was finished off with Danish oil. The blade was sealed with Lanolin (another job for moi) – and the knife was complete. Ooh – I almost forgot. Eric taught TRH how to sharpen the blade. It is super SHARP! Allow me to present the Raili Iiris knife – 12cm handle of York Gum burl with a 20cm Damascus steel blade. Thank you to Eric for his patience and teaching. Thank you to TRH for being a willing pair of hands. He learnt many new skills. And he still has all his fingers. much work goes into making a blade. It was on my feet, Elaine ! Job well done. We should all learn something new …every day. now that is so very cool Raili!!!! It’s gorgeous. Simply gorgeous. Love the blade. Love that it’s got your name on it. Thank you, ma’am 🙂 I love it too! I want to be part of your family and your DNA you’re all so damn talented it’s brilliant! It was such an interesting exercise to go through. And to be able to spend that time with my brother. Spending the time with your brother is the most important thing. What a memory the two of you will have now to share!